Love, Passion, Energy and Commitment! We’d like to take a moment to recognize the engine that drives Moja Tu, co-founder Kathy Kempff. Those of us in the US see first hand how hard Kathy works and know that it’s because she loves the children we’re helping so much. 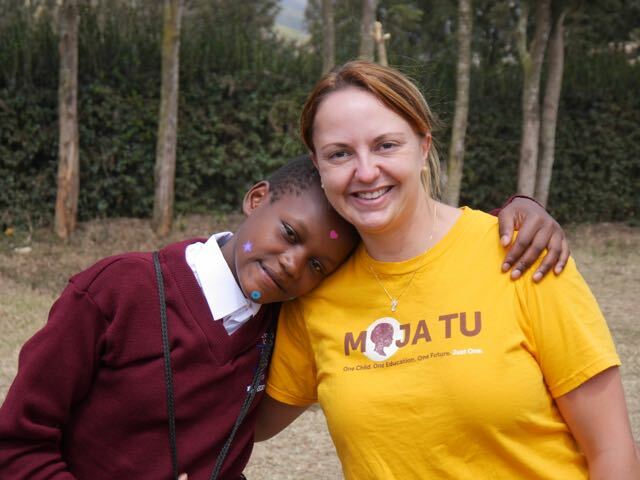 However, I think the best way to understand how truly special Kathy’s efforts are is to read the following, which was put together by Margi Nyawira, Moja Tu’s colleague in Kenya. First meeting with her and you can tell she is energetic! Her energy is evident even in her laughter. You get to know her and you realize she uses this energy to transform people’s lives. She gives her all to securing education for young Kenyans that are in need. She is Kathy Kempff, a young mzungu lady dedicated to the worthy foundation, Moja Tu. In a span of 2 years, she has seen 60 kids secure their right to education which otherwise would have been a luxury to them since their basic need is surviving the day. She has not only ensured kids are in school, she makes sure their health is checked constantly, their school books are in supply, their uniforms are neat, they all have school shoes, they can smile like other kids since they have essentials like toothpaste and other items as well as transport to and from school. Her energy is clearly seen when kids break for holidays, she ensures that most of the sponsors meet their kids via video conference. It takes a lot of effort to ensure that these relationships are sustained and stands by to understand the language of all the kids. At Tania Integrated and Rehabilitation Centre, Kathy is a household name. Every kid is excited at the mere mention of this name, ‘Kathy’. Talking to several kids and asking them what they think or remember about Kathy you get very many sweet answers and all of them come with a smile. Kids putting up their hands, fighting for the chance to air their comment. They are excited that she knows most of them by name and not just their English Name but their nicknames too! Picking them at random, the phrase ‘Mzungu Mrembo’ for ‘Beautiful white lady’ carried the day. All the kids love this great woman and you can feel the love when they start asking questions like when is she coming next, say hey to Kathy, and pass my greetings to Kathy among others. The weight of their love is felt when they say all these words in Swahili. Talking to the Tania management, they say she is an easy person to explain their hardships to. She is very understanding and her moral support is equal to the financial support she mobilizes for them. She ensures that they are well at the Centre by constantly finding time to make a video conference call and truly listen to them. Talking to Beatrice, the director of Son’s of Manase, she says she can’t wait to meet this lady with a beautiful heart that was God sent to rescue her 2 kids that were totally set to miss going to Secondary school. She is amazed that the lady is supporting these kids even before they join Secondary School. Thank you Kathy, for all that you do to help these wonderful children.